Blowing bubbles is a fantastic game for young children. 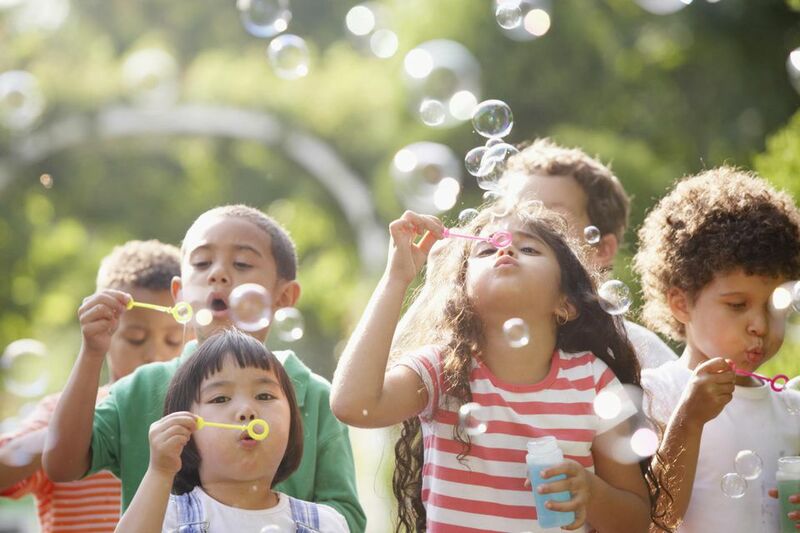 Children love to play with bubbles and can often go through a whole tube in one game, which can get a little costly. But, there's no reason you for you to pay an arm and a leg for what is essentially soapy water. With this easy recipe, you can make your own bubble mixture whenever you want. This is an easy project that takes only 15 minutes. You can even give the kids a bit of a science lesson by teaching them how to weight out the solutions themselves. Then they can make bubbles whenever they want and you can relax. Pour 1/2 cup of dish soap into the cup. Measure 2 teaspoons of sugar and add it to the water/soap mixture. Go outside and blow bubbles! The most popular game with bubble has got to be the old bubble blowing competition. Seeing who can blow the largest bubble is always fun. You can also see who can blow the most bubbles at once. Kids can also see whose bubble lasts the longest before popping. Another fun and more active bubble game is to have a bubble race. It's a very simple game to play. First, have the children stand in a race line. Choose a finishing point. Have each child blow a bubble and then try to blow that bubble over the finish line. The first child whose bubble goes over the line wins. Try not to make the finishing line to far away as bubbles are pretty unstable and you don't want an unbeatable game. Take the children's ages into account when deciding the distance of the finishing line. Don't feel like you have to make up games to play with bubbles in order to enjoy them. The simple act of blowing bubbles is enough fun on its own for most children. If you really want to vary their bubble blowing experience try switching up what they use for bubble wands. Anything that forms a plastic hole, like the top of a soda bottle or a plastic six-pack ring, can be used to blow bubbles, as long as it can get wet. Paper and cardboard products don't usually make for good bubble wands. Bubbles are a great way to experiment with different textures and shapes. Don't shake or stir your bubbles too much. Store your bubbles in a tightly sealed container. Experiment with blowing bubbles using different items! You can recycle an old bubble jar by refilling it with your homemade bubble mix.